Should I have copyrighted my business name? I just found out through Facebook that a photographer in Kannapolis, NC has also been using the name “Simply Light Photography” since 2013 possibly. I’ve been using that name for a while now and had it registered back in 2008. Of course, I’d want to say that I had first claim to that name because no one else used it back when I started my photography business (the registry has documentation of this). The registry and I both did a name search. Did she coincidentally come up with that same name? Did she not do a name search when she started up? I also now started to wonder if I should have copyrighted the name at the start. I intended to contact her about it but changed my mind after I just learned that the name could only be trademarked/copyrighted provincially. So, that name is “fair game” elsewhere then. I’ll just leave this alone because there’s not much I can do about it then. Thank you to Kove Kitchen! I did a commercial food shoot for Kove Kitchen last summer in 2014. Their new website is up and running now, and it looks great! Thank you to Kove Kitchen for using some of my pics there! I hope to be able to head back there in a few months to shoot more pics for them! Because I should try to get other types of content here besides just photos, I suppose I could write another article now. The last one I wrote, which was a while ago here, was on pet photography tips. Rather than another tutorial, I think I’ll write an editorial this time. best or ideal for food photography, and I am in complete agreement. Second, I do realize that photography can be subjective in general. Third, this editorial is more for the novice food photographers. Fourth, this editorial is just my opinion. I recently came across some articles which stated that flash is bad for or should never be used in food photography (I believe the writers were just getting started in food photography). I have to for the most part disagree with that viewpoint. Why did I just say “for the most part”? Well, if one “overflashes” the food, of course it’ll look bad! Still, in general, I think that flash shouldn’t be completely avoided in food photography. Moreover, I recall that one of the writers had recently taken a course on food photography with professional instruction. Did this course teach that flash should never be used in food photography? Gosh, I hope not! Just to clarify something first, “flash” in the context of photography refers to an artificial light source that emits bursts or pulses of light. “Flash” usually refers to a camera flash (built in or external) or strobe lighting. 1) Restaurant with no windows and the restaurant lighting is poor (warning: the lower the restaurant lighting, the brighter the flash will have to be!) – I say that you have no choice but to use flash here because it’ll just be too dark! If you don’t want to, you may try adjusting the settings on your camera but at a cost though. A high ISO may (you may be okay if you have a full frame camera) make your image grainy. A wide aperture will only make a small portion of your image in focus. A slow shutter speed may make your image blurry (if you’re not using a tripod). You may also have to contend with any potential color cast from the restaurant’s artificial lighting. 2) Restaurant with windows, dark outside (night time), restaurant lighting is poor – You really should be using the flash here too! 3) Restaurant with windows and natural light, windows don’t face the sun though, you’re sitting by the window, the food is mainly lit by the natural light and not by the restaurant’s artificial lighting – It’s great in that there is natural light. However, if you just use the natural light, your food pic will probably end up with a blue color cast and the overall colors will look too flat because you are essentially shooting in the shade. You can try to adjust the white balance settings on your camera to correct for the color cast but the overall colors will still look too flat. I’d recommend using the flash here because it’ll get rid of the blue color cast and liven up the colors. Photoshop may be able to correct for the color cast; however, it’ll be tricky to correct for the flatness of the overall colors. Get some “safety shots” with your flash. 4) Restaurant with windows and natural light, windows not facing the sun, you are sitting far away from the window, the food is mainly being lit by the restaurant artificial lighting (incandescent lights) – You can try to get your shot using the restaurant lighting; however, there will probably be a yellow cast from the incandescent lights. The white balance settings on the camera may be able to correct for the color cast. In addition, is the intensity of the incandescent lighting strong enough to bring out the colors of the food? Can you effectively use Photoshop to bring out the overall colors of the food without it appearing unnatural? Again, it is best to get some “safety shots” with the flash because it’ll for sure cancel out the cast and liven up the colors a bit. For examples 1) and 2) above, I say you have to use the flash. However, you may be able to get away without using it for examples 3) and 4). If one knows how to use the camera flash correctly (the settings) and effectively alone or in combination with the ambient lighting, the food actually can turn out to look okay. 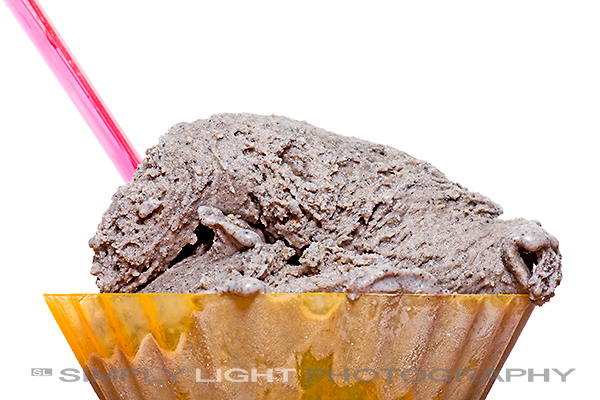 In addition, the use of diffusers and/or reflectors can also help to make the “flashed” food shot turn out okay. Knowing how to use photoediting software can also help in making the shot turn out okay. Here’s another reason for using flash. If you want to bring out some detail in the shadow areas of the food, one can use a little “fill flash” to help out with the shot too. If you want to give the food a different look rather using natural light all the time, it is perfectly okay to experiment with flash photography. 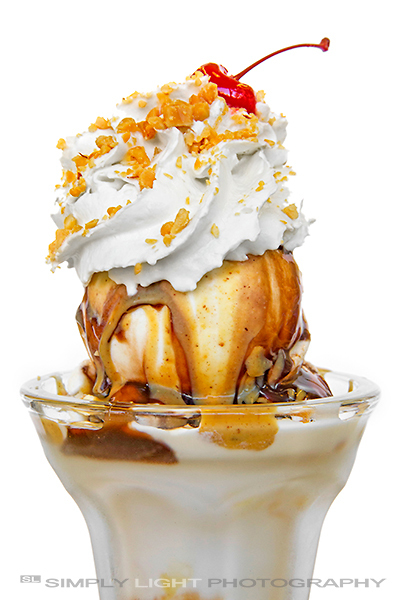 A lot of the food photography done in restaurant advertisements (including menus) most likely incorporate flash photography in the form of strobe lighting. An example would be the pictures of burgers in fast food restaurants. Take a good look at those pictures. A flash was most likely used. Does the food really look that bad? I don’t think so. Well, at least to me they look pretty good but still not as good as using natural light of course! If I absolutely had to use flash to shoot food, I would much prefer strobe lighting over a camera flash because of better control of the direction of light and lower temperature of the light. However, I’d still consider experimenting with a camera flash just to get a different look! In closing, it seems like this editorial was sort of a tutorial as well! Most importantly, flash photography for food isn’t as bad as it may seem. Don’t be afraid to use it. Please experiment with it! I think I forgot to mention this quite a while ago. Simply Light Photography is now on Instagram. Please follow! Thanks! Thank you to Drift Food Truck, 100.3 The Bear, and Lochlin Cross! 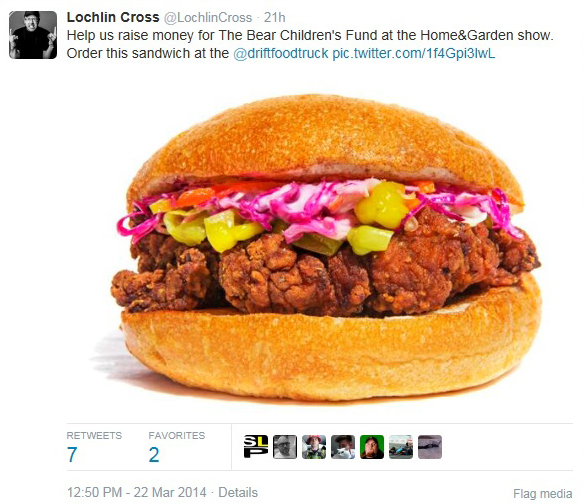 Thank you to Drift Food Truck, 100.3 The Bear, and Lochlin Cross for featuring my pic of Drift’s Buttermilk Fried Chicken sandwich for The Bear Children’s Fund money raising. 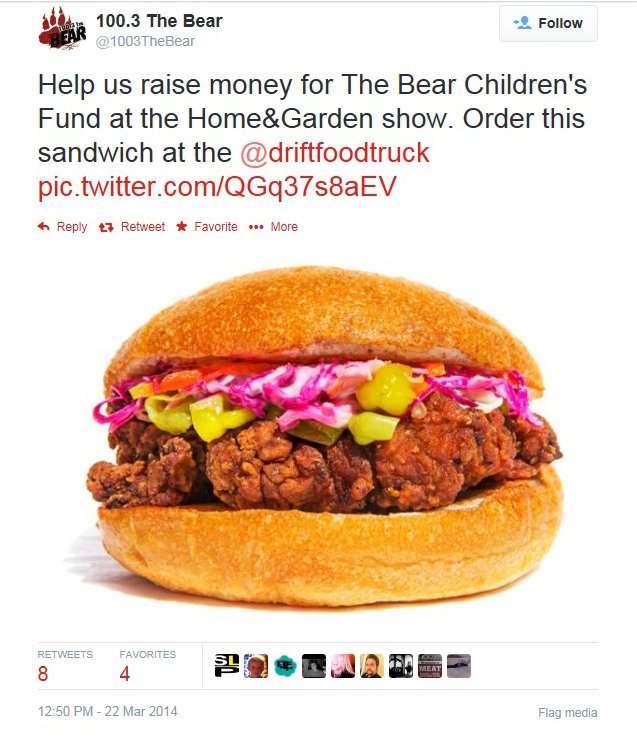 For each sandwich sold during the 2014 Edmonton Home + Garden Show, $1.00 goes to The Bear Children’s Fund! By the way, Simply Light Photography is also on Twitter! There’s some different content there that you won’t find here!